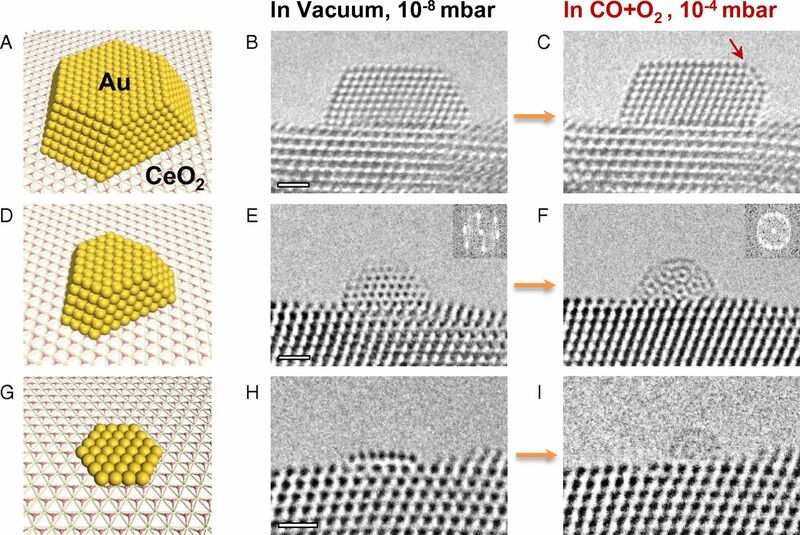 Dynamic structural changes of various gold nanostructures supported on CeO2(111) upon exposure to the reactant gases. (A–C) Model (A) and HRTEM images (B and C) of a 4-nm Au NP with ∼1,000 atoms; the arrow in C indicates the Au(100) surface reconstruction. (D–F) The <2-nm Au NP with 100∼200 atoms; the insets show corresponding fast Fourier transform of the Au NP. (G–I) The ∼2-nm SL with ∼40 atoms. (Scale bars: B, E, and H, 1 nm; also apply to C, F, and I, respectively). Enlarge Image. Gold is the noblest metal—the most resistant to oxidation. However, nano-size gold has a unique ability to perform as a catalyst, even at low temperatures. The underlying mechanism for this size-dependent change in properties has puzzled scientists since the phenomenon was discovered in the late 1980s. Why it matters: In situ studies of ultrasmall gold clusters in a reactive environment have been lacking, making it difficult to verify the origin of the size effect in catalysis. This study used in situ transmission electron microscopy to reveal that gold nanoparticles, when isolated down to a critical size, undergo dynamic structural changes under the catalytic working conditions, and all gold atoms in a cluster can be activated to promote the catalytic reactions. Evidence of the transformation at this ultrasmall scale can only be obtained through in situ and operando characterization. This finding challenges the classic thinking that gold as a catalyst retains the same structure between static and catalytic conditions. In fact, these otherwise stable ultrasmall gold clusters can transform to a metastable phase. The results also suggest that the nanocatalysts may work as dynamically generated single-atom catalysts, a concept that has aroused remarkable recent interest in the catalysis community. "The detailed structure-stability-property relationships established here can lead to a paradigm shift in designing atom-efficient catalysts," Wang says. Summary: Ultrasmall gold clusters supported on single crystalline ceria [CeO2(111)] thin films were exposed to reactant carbon monoxide and oxygen (CO + O2) gas using in situ environmental electron microscopy combined with computational modeling and ab initio molecular-dynamics simulations. The researchers observed different structural responses to the reactant gas depending on the size of the nanoparticle. In its ultrasmall (tens of atoms) form, a gold nanoparticle displayed dynamic structural changes under the catalytic working condition; the intrinsic structure was lost and the clusters became disordered, while dynamic low-coordinated atoms formed at the surface. The ab initio molecular-dynamics simulations confirmed these observations and further revealed that the generation of dynamic low-coordinated atoms via gold-carbonyl species could act as dynamic active centers for CO oxidation. For slightly larger nanoparticles (up to a few hundred atoms), the otherwise stable face-centered cubic structure transformed to a disordered structure under CO and O2 exposure, which became liquid-like and simultaneously formed low-coordinated gold atoms. In contrast, the larger nanoparticles maintained their structure while undergoing localized surface reconstructions. The size-dependent structural response to reactant gas, especially generation of dynamic low-coordinated Au atoms in ultrasmall gold particles, can effectively boost the reaction through facile transport of the CO to reaction sites, hence delineating a root cause for why small size matters for gold catalysis and why larger gold nanoparticles tend to become inert. What's next? The team believes more work should be done to explore how the gold nanoparticles transform from their ordered structure to a disordered structure, and to understand whether this size effect also exists in other catalytic systems. They are seeking additional funding and resources to support expanded research in this area. Acknowledgments: This work directly addresses two Basic Research Needs Priority Research Directions for Basic Energy Sciences: (1) Basic Research Needs for Synthesis Science for Energy Relevant Technology, Priority Research Direction 4 (Integrate emerging theoretical, computational, and in situ characterization tools to achieve directed synthesis with real time adaptive control); and (2) Basic Research Needs for Innovation and Discovery of Transformative Experimental Tools, Priority Research Direction 2 (Create innovative experimental methods for investigating “Real-World” systems, in particular, through in situ and operando characterization of active sites and intermediates). Sponsors: This work was supported by the Laboratory Directed Research and Development (LDRD) program at PNNL; the National Science Foundation (NSF CMMI 1536811); the National Basic Research Program of China (2013CB834605); Scientific Research and Users with Potential Grants of Hefei Science Center of CAS (2015SRG-HSC031, 2015HSC-UP022); the National Key Basic Research Special Foundation (2013CB834603); National Natural Science Foundation of China (91645203, 21521091, and 21590792); and the William R. Wiley Environmental Molecular Sciences Laboratory. Yingge Du's work was supported by the U.S. Department of Energy (DOE), Office of Science, Office of Basic Energy Sciences, Early Career Research Program under Award No. 68278. User Facilities: The work, including part of the computational calculation, was performed at the William R. Wiley Environmental Molecular Sciences Laboratory, a national user facility sponsored by the U.S. Department of Energy Office of Biological and Environmental Research, and located at PNNL. Research Team: Langli Luo, Yingge Du, and Chongmin Wang (Pacific Northwest National Laboratory); Jun Li (Pacific Northwest National Laboratory and Tsinghua University); Yang He and Scott X. Mao (University of Pittsburgh); Jin-Cheng Liu and Yang-Gang Wang (Tsinghua University); Junfa Zhu (University of Science and Technology of China). Reference: Yang He, Jin-Cheng Liu, Langli Luo, Yang-Gang Wang, Junfa Zhu, Yingge Du, Jun Li, Scott X. Mao, and Chongmin Wang, “Size-dependent dynamic structures of supported gold nanoparticles in CO oxidation reaction condition.” Proceedings of the National Academy of Sciences (July 24, 2018), DOI:10.1073/pnas.1800262115.